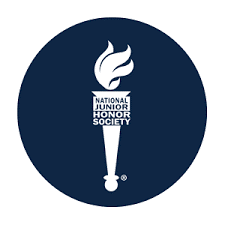 The National Junior Honor Society (NJHS) is one of the nation’s premier organizations established to recognize outstanding high school and middle level students. More than just an honor roll, NJHS serves to honor those students who have demonstrated excellence in the areas of Scholarship, Leadership, Service, Character and Citizenship. These characteristics have been associated with membership in the organization since their beginnings in 1929. • Students must be a member of the eighth, ninth, or tenth grade class. • Students in 8th and 9th grades must have earned an overall average grade of 97% or higher for the year prior to induction. • Students in 10th grade must have earned an end of year weighted cumulative GPA of 4.10 or unweighted cumulative GPA of 3.85 or higher. • High school students must take at least one honors course per year during their freshman and sophomore years. • Candidates must meet a required daily attendance rate of 95% of all school days excluding excused absences for the year prior to induction. • Continuing membership requires maintaining an overall average grade of 97%, a cumulative weighted GPA of 4.10 or unweighted cumulative GPA of 3.85 or higher.